Handmade in England, this brush uses Super Badger Hair, which is the highest grade. Ultra soft on the face yet hard wearing this is a luxurious shaving brush.Embossed on the brush is the Executive Shaving logo and 'Handmade in England Super Badger'. This Gillette Mach3 compatible razor is finished in traditional jet black. Unusually, this razor has an aluminium handle for addition heft. 60 g in weight and 125 mm in length, the Executive Shaving Mach3 razor has been designed to provide optimal balance whilst sitting comfortably in your hand. The sleek aluminium handle provides perfect grip and balance. The Gillette triple blade technology used in Mach3 razors has three blades specially positioned to extend gradually closer to your beard, to give you a close shave in one single stroke. 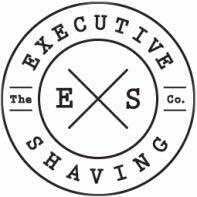 The razor is branded with the Executive Shaving logo. This high quality Italian crafted chrome shaving stand is ideal for storing and displaying your razor and brush. This cleverly designed shaving stand allows the brush to rest at an angle, drip drying and aerating naturally which will prolong its life. We suggest anyone who is new to wet shaving should watch a few YouTube tutorial videos to get some tips on how to lather up properly and how to shave with a Mach3 razor. Good value, good looking and ideal for a wet shaving gift for men of all ages and skin types.